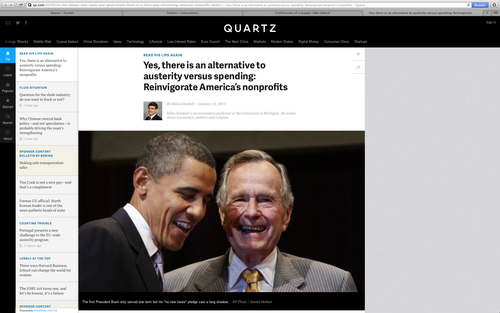 Here is the full text of my 12th Quartz column, “Yes, there is an alternative to austerity vs. spending: Reinvigorate America’s nonprofits,” now brought home to supplysideliberal.com. It was first published on January 15, 2013. Links to all my other columns can be found here. © January 15, 2013: Miles Kimball, as first published on Quartz. Used by permission according to a temporary nonexclusive license expiring June 30, 2014. All rights reserved. Republican Speaker of the House John Boehner made a nod toward this pledge two weeks ago, pushing for the temporary resolution of the fiscal cliff, when he reminded his rank and file that, technically, taxes had already gone up, due to the expiration of the younger Bush’s tax cuts at year end. The implication was that members of Congress would really be voting for a tax cut, not a tax increase, and so would not be breaking their pledge. There is no doubt that this matter of interpretation will feature prominently in the GOP primaries in 2014. The ongoing crisis in long-run US taxing and spending policy is born from the collision of an almost unstoppable force on the spending side with Grover Norquist’s almost immovable object on the taxing side. Former Treasury Secretary Larry Summers ably describes the almost unstoppable force on the spending side in his Washington Post editorial “The Reality of Trying to Shrink Government.” The bottom line is that the explosion of government spending is primarily the result of (1) an aging population, (2) having to pay interest on ballooning government debt, and (3) the increasing cost of medicine that keeps discovering ways to do more with the expensive skilled labor of doctors and other medical professionals. To put it bluntly, the only way to keep government spending constant in the future, let alone reduce it, would be to dramatically reduce benefit levels for Social Security, Medicare and Medicaid, or to gut all the other functions of government, from national defense to the judicial system to scientific research. It is easy to be misunderstood when mentioning Hitler, but here I want to invoke a comparison solely in his role as an inept commander-in-chief of the German armed forces and in no other capacity. In his book, The Storm of War: A New History of the Second World War, Andrew Roberts argues that Hitler’s no-retreat, “stand-or-die” orders were strategically disastrous for the German forces. German generals had a brilliant record at turning tactical retreats into great German victories. But Hitler’s stand-or-die orders took away the advantage of maneuver and left German troops to be mowed down by the Russians under Stalin. My point is that the “stand-or-die” approach is likely to do no better against the spending juggernaut than it did against Stalin. But then what? I propose that many of the jobs the government has set for itself actually be done outside the government, by the non-profit sector. A public contribution is a donation to a nonprofit organization meeting high quality standards that engages in activities that (a) could be legitimate, high-priority activities of Federal or State governments and (b) can to an important extent substitute for spending these governments would otherwise be likely to do. My proposal is to raise marginal tax rates above about $75,000 per person—or $150,000 per couple—by 10% (a dime on every extra dollar), but offer a 100% tax credit for public contributions up to the entire amount of the tax surcharge. In addition to helping the government budget by taking over tasks the government is now doing and by reducing revenue lost to the current charitable deduction, I believe the non-profit sector (with the usual level of regulation) can do many things better than the government, and this program would be much less painful for people than paying the same amount in taxes. It is easy to find fulfillment in philanthropy. There is satisfaction in knowing one has made a difference in the world, in a way of one’s own choosing. And giving can serve as a good opportunity for teaching children to care. No doubt, some would view these contributions to charitable causes as almost as onerous as the taxes to which they would be an alternative. But I don’t think that would be the typical reaction. I have spoken of a thousand points of light, of all the community organizations that are spread like stars throughout the Nation, doing good… . The old ideas are new again because they are not old, they are timeless: duty, sacrifice, commitment, and a patriotism that finds its expression in taking part and pitching in.